Black Friday. Small Business Saturday. Cyber Monday. It’s a busy time for many shoppers (not to mention frazzled retailers.) But for our purposes, the pending start of the new church year, starting with Advent next weekend, is more pressing. It has been so fun sending out a lot of books this week — thanks to those who paid attention to our Advent book list from last week’s BookNotes. The Art of Advent has been the biggest seller this week, with Wounded in Spirit not far behind. I think the next popular has been the paperback edition of Tim Keller’s Hidden Christmas. There are others that deserve mention and perhaps I’ll name more later. 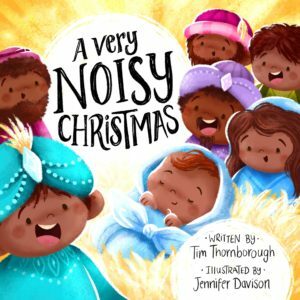 Now, though, as promised, we wanted to offer a quick list (we are among those frazzled retailers, remember) of a few new children’s books that you may want to have on hand these next sacred weeks. What a simple, powerful practice to call the whole fam together for a time of worship or conversation lit by candlelight glow — the best part for some kids — that can help us focus on the meaning of the season’s longings. 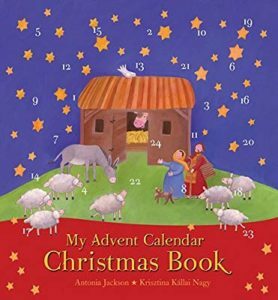 My Advent Calendar Christmas Book Antonia Jackson & Krisztina Hallai Nagy (Lion Press) $7.99 Lion Press from the UK is a favorite (favourite) children’s publisher and we were glad to discover this little gem. It is a fairly standard little book telling the story of the nativity except the cover of the book is itself a 23-day, open-a-flap-a-day Advent Calendar. The entire Christmas story is here, from annunciation to the flight to Egypt and it’s fine. But the joy is opening the little flaps and awaiting each day’s surprise. The book is 6.5″ x 6″ and the advent flaps are small. We have more conventional Advent calendars, by the way, Give us a call if we can tell you about some. 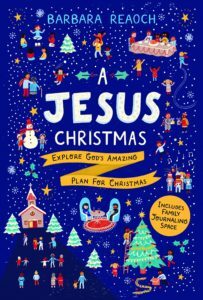 A Jesus Christmas: Exploring God’s Amazing Plan for Christmas Barbara Reaoch (The Good Book Company) $9.99 I like the cool, slightly contemporary look and design of Good Book Company products and this little family workbook is no exception. Ms. Reaoch is known in “Bible Study Fellowship” for those that know that great ministry, and it should convince you that she is careful about Bible study, about application, about seeing how all things cohere in the message of Christ’s gospel. These short daily studies can help your family get excited about a fresh way to prepare for Christmas by taking a look at one of the serpent’s lies (from Genesis 3) and the ways in which the glorious truths of God’s redemptive plan play out. Joni Eareckson Tada says it is “just what fathers and mothers are looking for.” I hope that is true. 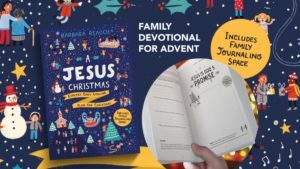 Donald Whitney writes, “If you have young children and you want to make this Christmas more of a ‘Jesus Christmas’ than last year, try this book.” It includes space for family journaling, too. Nicely done, for sure. 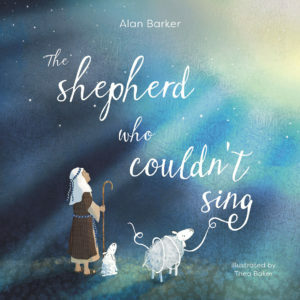 The Shepherd Who Couldn’t Sing Alan Barker, illustrations by Thea Baker (SPCK) $9.00 I really like the illustrations that are rich and warm, creative without being eccentric. There are fabric patterns through-out that are striking, and some water-color washes that are very artful. So I’m a fan of this paperback — even its paper stock and size (about 9 x 10) seems just right. The story is fun; it is about Jake the shepherd boy on the hills of Bethlehem who, er, can’t sing. Can he find his voice and join in the angels given the momentous good news he has just witnessed? He is so brave about so many things but he is afraid of singing! The author tells us at the end that it was inspired by Caedmon who learned to sing. (He even gives a little song to sing to the tune of Frere Jacques called, of course “Jake’s Song.”) Jake’s plight is a creative way into the Bible story, but it raises this other concern, of not being afraid to sing, to find one’s voice in the choir, to stand up and sing-out. Nice. And if you’re lucky enough to have a grown-up read to you, make sure that they use their loudest, softest, and silliest voices! 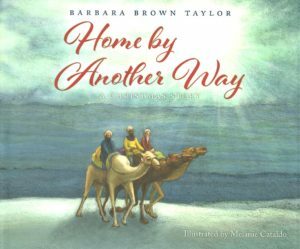 Home By Another Way Barbara Brown Taylor, illustrations by Melanie Cataldo (Flyaway Books) $18.00 When one of our most beloved and interesting preachers and writers teams up with an excellent, talented illustrator to re-tell one of her famous seasonal sermons, you’d expected it to be much anticipated and much discussed. And this certainly is. Surely one of the most beautifully-illustrated children’s books of the year, it is great addition to the library of anyone who collects Christmas books. It’s a bit odd, even funny at times, but so many holiday books are. It’s part of the fun, I think, re-telling and re-imagining these great, classic stories. And how she puts us right onto the quirky camel rides of these three mystics from the East. You can see some of the Home By Another Way art in this short trailer. This story is about the wise men and their journey to meet the Christ child (and, of course, their anxiously freighted meeting with the dangerous Herod.) Some have found it a bit unusual, describing the characters in such odd detail. Others have thought it unfortunate how small of a role the holy family plays, but, again, it gets at that story by way of describing in artful prose the journey of the wise guys. And yet, wordsmith that Taylor is, she tells of how their lives are touched as they hold the baby close. This encounter will surely transform their lives even if the teller of the tale does not spell it out for us. That is BBT’s theory about preaching, I believe — don’t say too much, allow some time for “I wonder” type questions, don’t be too didactic: the power is in the story, after all. So this ought not be the only book to read to children about Christmas; obviously. And — please — realize it is to be read after Christmas, of course. The imaginative story is a fascinating one, glorious in its own way, drawing on a famous old sermon by the former Episcopal pastor. 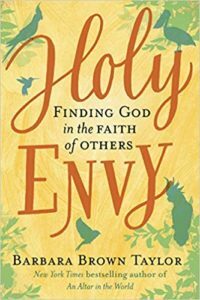 Taylor now is a professor of world religions at a Georgia college and, in fact, has a long awaited book coming out this March (2019) about her experiences there, entitled Holy Envy: Finding God in the Faith of Others (HarperOne; $25.99.) You can pre-order it now, of course, at our BookNotes 20% OFF — we already have a waiting list for it. 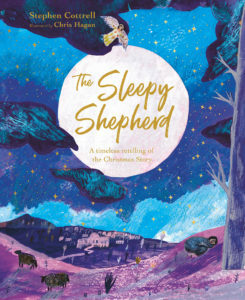 The Sleepy Shepherd: A Timeless Retelling of the Christmas Story Stephen Cottrell, illustrations by Chris Hagan (SPCK) $10.00 Kudos to our friends at InterVarsity Press for picking up some of these SPCK British books from overseas and making them easily available in the States. This is a fun and funny story and I like it not only because the writing is good but because the art is a bit more eccentric and zesty than some. I don’t always think young children resonate with mature modernist or abstract art, but this is wildly creative without obscuring the content of the story. It does what good art can do — revealing something formerly missed. If only to generate a fresh and invigorated gaze, this book is just so interesting. I don’t know enough about art history to name the influences of this clever children’s illustrator, but there’s some stuff flying around here, hands raised — Marc Chagall, maybe? Some of the middle eastern figures are wearing what seem to me to be Mexican ponchos with really striking horizontal lines. The folk art impressions are obvious. There are vivid sky scenes, and little illuminations and maybe even some arabesques. Anyway, it’s an inexpensive kids book, but I found it notable. The text The Sleepy Shepherd is longer and for elementary children, unlike some picture books which are best for pre-schoolers. It starts with the Bethlehem shepherds, of course, one one sleepyhead named Silas, but follows the life of Jesus until, unexpectedly, Silas meets Jesus late in his life. That Grace Comes at Christmas is bi-lingual makes it a great gift for anyone who is interested in multiple languages, in Latino culture, even those interested in the current immigration news. And certainly it is a rare, delightful book for anyone who speaks Spanish. Gracias Viene in a new pet named Sublime Gracias, Amazing Grace. 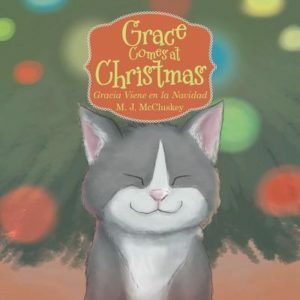 This is a fun, fun story, a lovely little parable, and all the proceeds go to local York area charities. You probably will not see this book anywhere else, so it will be a special surprise for the little ones you know when you order from us. We’d be happy to send one (or more) out right away. By the way, we can special order a rare bi-lingual Russian/English edition of it as well, that M.J. put together. She knows of a town where there are a lot of Russian immigrants so she developed a Russian/English edition. She’s that kind of person. You should have her book. 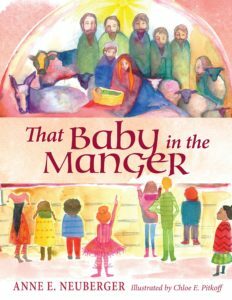 That Baby in the Manger Anne E, Neuberger, illustrations by Chloe E. Pitkoff (Paraclete Press) $15.99 This was a best seller for us last year so we wanted to name it again. It is paperback with colorful, somewhat modern art, which makes it a beautiful sight to behold. It is just creative enough to provide allusive nuance to the portrayal but it isn’t odd or disorienting. That is, it is just a great visual treat. The story is more than a treat, it is nothing short of a profound blessing, nearly prophetic in its gentle but potent truth-telling. Neuberger tells here a true story of a Catholic priest who is talking with the children of his parish — children of non-European descent. As they reflect on the creche scene, they children ask if Jesus really had blue eyes. Lurking just below the surface of The Baby in the Manger is this child-like question that has adult-world ramifications: can people of color relate to a white Jesus? Or, better, can Jesus relate to “all the children of the world” as the Sunday school song promises? This very clever priest, Father Prak, has this situation on his hands and invites the children to bring their own dolls to the nativity scene. Oh my, the glory of what happens and the great love this pen and watercolor artist put into her illustrating it is spectacular. It is fun and sobering, joyful and touching. Yes, let’s be clear: it gets at issues of racism and true inclusion but it does so with great care and gentle storytelling. What a book. Please, please, give this a try. Buy a few and spread the word. No matter what you or your friends look like, no matter who they are, the Christ child is born for them. Do you believe this? Can you proclaim such the wide, wide mercy of God without having this conversation? This book is a tool to help, as the best stories always are. Highly recommended. The Birth of Jesus Read-Along Regina Brundidge-Fuller, illustrations by Jeff West (Urban Spirit!) $6.99 We have bunches of inexpensive re-tellings of Bible stories and of course the Christmas story ones are as popular as any. 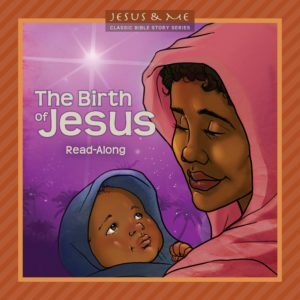 It is so cool that at this time of year it isn’t uncommon to give out books about Jesus, and, to children, books about the birth of Jesus. Yes! Of course, it is a complicated matter to find books that retell the story well and that have illustrations that are well done and wise. For those that care about these things, we have this (and a few others) unique one published by Urban Spirit! who does ministry out of Atlanta, As you can see, most of the characters in these illustrations are black. (Interestingly, the angels are multi-ethnic, and Herod seems to be white, naturally.) I do not want to say these are only for the African American market – nearly every church nursery in American has Bible stories of Jesus or Bible characters looking white. Why not supplement your church or family library with something like this. Certainly is is designed for African American children, but we’re happy to suggest it to all sorts of families and churches. They are well done. 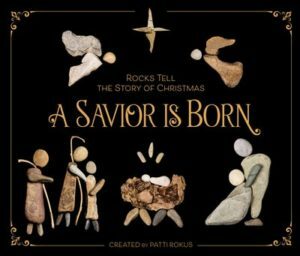 A Savior Is Born: Rocks Tell The Story of Christmas created by Patti Rokus (Zondervan) $17.99 I suppose this isn’t just a children’s book as the curious, artful presentation will make it an attractive coffee table book for anyone, or a unique gift for a person who might enjoy such a book. My wife collects little pebbles many places she goes as both memory stones and as decoration. It isn’t uncommon to find a few smooth stones or a pile of small rocks on a window sill or by my sock drawer. I’m sure she isn’t the only one who is intrigued by the aesthetic revelation of small stones. And so, I’m sure many will enjoy this simple book showing the Christmas story created by stones. We have for several years promoted a breathtaking book with bi-lingual English and Arabic text about immigrants, where all the artwork is made with stones. 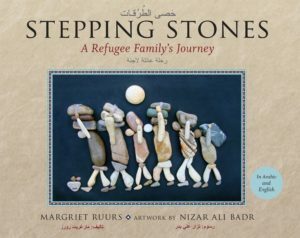 It is called Stepping Stones: A Refugee Family’s Journey and was inspired by the stone artwork of Syrian artist Nizar Ali Badr, discovered by chance by Canadian children’s writer Margriet Ruurs. (Orca Books; $20.00.) That is nearly miraculous and very poignant. I like this author a lot — she has a bunch of videos and even guide on how to do this art. Here she is making a nice explanation of why it matters, getting kids find a connection to God by creating with the creator. Enjoy a short video: here. Look for the sequel to A Savior is Born: Rocks Tell the Story of Christmas this winter which will be called Jesus, My Savior: Rocks Tell the Story of Easter. 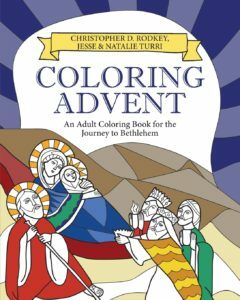 Coloring Advent: An Adult Coloring Book for the Journey to Bethlehem Christopher D. Rodkey and Jess & Natalie Turri (Chalice Press) $12.99 Speaking of adult books that kids can appreciate, this is pitched as an adult coloring book, and for good reason. As we explained a year ago (and, again, as we did with the sequel, Coloring Lent) Chris Rodkey is a friend and neighbor and a scholar/activist/pastor of a UCC church here in D-town. We are theologically dissimilar in many ways but I so admire his eagerness to do creative stuff and speak with theological depth into the issues of the day. And so, you should know that this coloring book is very intentionally created out of his progressive/radical sort of deeply theological worldview. It follows the lectionary readings for Advent, and so is very, very Biblical. There are little devotional sentences on each page which are footnoted so you can explore more of why the art is created as it is, and why the paraphrase of the lectionary texts are done as they are. Coloring Advent is ecumenical and provocative and is unlike any other more conventional adult coloring book, but, at the end of the day, it is designed for your own slow, creative, engagement with Sacred Scripture by way of working on your own sacred art. Can children and families use this detailed, serious coloring book? For those with older children or teens, of course. Can you deepen the quality of your faith conversation by pondering some of the ever-so-slight nuances of text and image in Coloring Advent, even with your children? I think so. Breath deep, have fun. 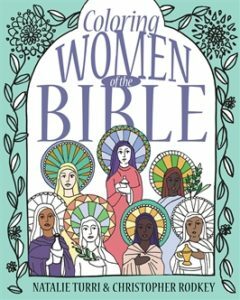 By the way, although, again, mostly for adults but suitable for some older kids, see the new Coloring Women of the Bible (Chalice Press; $14.99) also lovingly done by Rev. Chris Rodkey and Natalie Turri. It has some vital theological interpretation, brave portrayal of complicated Scriptural stories, and a section of pages to color the feminine images of God from the Bible. There is no other coloring book like it, that’s for sure; it would be fascinating to have younger teens or youth do it. I’ll write more about this later as it makes a great small gift (especially when paired with a pack of colored pencils.) Cheers. This entry was posted in Uncategorized by Byron Borger. Bookmark the permalink.